This display was last shown on September 16, 2000. Inspired by "everything," Katherine Pence especially enjoys designing patterns based on traditional and ethnically motifs and techniques. 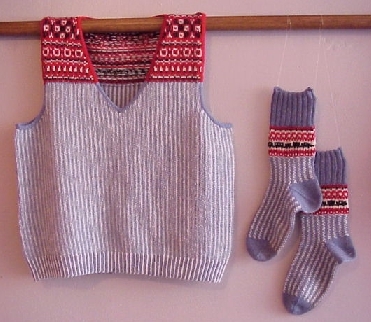 Her sweaters, vests, hats and socks reflect Nordic, Bavarian, Mideast influences. This dramatic coat/sweater is double-knit and can be worn with either side out. 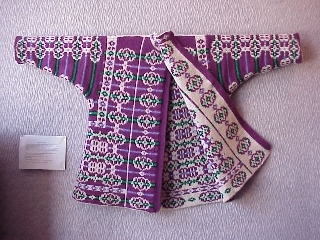 The double knit technique created two fabrics (layers) that are interlocked by the knitting in such a way that the colors appear on both sides. design, knitting technique and workmanship all make her garments stand out. garment design make the socks, vests, and hats a celebration of Fall beauty. Two vests designed with bavarian twisted stitches radiate a sophistication and sharpness often seen in the old world. The dramatic Russian-inspired sweater's diagonal design is achieved by two-stranded knitting in bold colors. 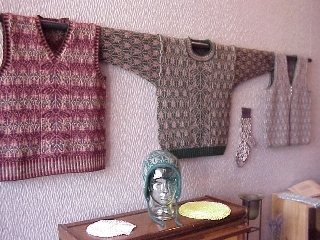 knitting designs were recently displayed here at The Dining Room at 209 Main. The "roots"of her knitting are also fascinating. As a child Katherine learned to knit from her mother, Rachael Misegades, who learned to knit at the age of 6 from her grandfather who knit his own stockings. This history was the basis for the book of sock knitting patterns written by Katherine. Despite his busy life on a farm, as postmaster, and general storekeeper James Chamberlain always knit his own stockings. Katherine called this first book AND A TIME TO KNIT STOCKINGS, in honor of James whose mother could not find a time to knit stockings and taught each of her twelve children to knit their own, beginning in the 1830's. Katherine offers a variety of designs in her book, one for each month although James probably used the same pattern over and over. A bout with frostbite forced him to change his pattern at one time to stockings that covered his shins. Restoration of the Cass Street Railroad Station in Fort Wayne, Indiana, inspired this vest and sock design. The Cass Street vest and sock were designed to celebrate railroad history. It mimics the fabric used in engineers' overalls, the red bandanna, and a tiny steam train. After the renovation of the Cass Street Station as an historic landmark from the 1800s, it now serves as a yarn shop. No wonder those of us in Monticello where two railroad lines were a significant heritage and from which were derived the annual "Depot Days" celebrated all over Green County in Wisconsin find this fascinating! Also exhibited are four knitted lace patterns knit by Katherine's mother, Rachael, now 94 years of age. Rachael knits every day and four of her beautiful doilies are mounted and on display in the dining room. The unique cable-like crossings in two of these doilies creates a beautiful 3-dimensional effect. Rachael, born in 1906, raised in Kansas, graduated from college in 1932, and worked as a school teacher, has lived in Fort Wayne since 1935. When asked about her favorite yarns, she favors Satakali, Guernsey, and Shetland wool (available from Meg Swansen), Dale, Brown Sheep, and Wisconsin's own Jan Kimmet's angora/wool blends. The Dining Room at 209 Main is taking preorders for Katherine's next book -- a knit vest book, some vests of which are in this current display.